We’re big talkers. We debate and dream and create. There are issues that good people should agree about on but it gets complicated by reality. A cure for cancer or missile defense? Big business or the environment? Recycle or a one-size-fits-all trashcan? And everyone knows a rescue pet is the right choice, as long as they’re healthy young purebreds with no bad habits. We all live at the intersection of big talk and inconvenient reality, trying to define our personal integrity. In other words, is it more important to write or clean the bathroom? Wait! That’s a plotline for a book! Come to think of it, most romantic comedies revolve around a dishonest moment dressed up as an amusing misunderstanding. Murder mysteries depend on things not being as they seem and the reader joins the search for the killer… an attractive genre for people raised like me. Dishonesty, hidden agendas, and unknown resources all become creative license for a writer. We plot the word-to-action disconnect and get to weave in the questions we want to ponder along the way to the ending we choose. We’re all gods in our writing. There’s just one problem. If you don’t actually sit down in the chair, technically speaking, then you never get to create the character who saves the world. Apparently, deceiving yourself isn’t the same as tricking a reader. Good intentions and reasonable excuses don’t get words on the paper. Let’s start with an assumption: We all have busy lives. We all work. We all have families, friends, and commitments. And most of all, we all have excuses. Some of them are real and some are not, but we’ve all heard or uttered an endless number of good reasons to not write. Yet, here we are. None of those excuses is the real excuse, by the way. I think laundry and work and sleep are fake excuses, covering up the biggest challenge to writing …self-judgement. We’re critical of each word before it hits the paper. We hem and haw. We say that we write for our private pleasure, but then spank each word as a failed Great American Novel. We let our words get too precious. Add guilt and regret into the mix. Then worst of all, we censor ourselves. Writing is easy. 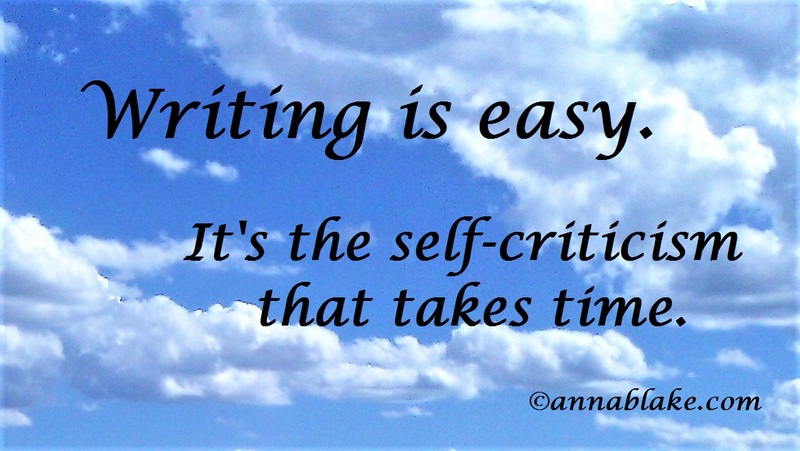 It’s the self-criticism that takes time. Snap out of it. Get over yourself and your artistic tantrums. Like any other skill, practice is the key to fluency. Criticism is the key to self-loathing. What if you let it be as simple as a choice? When I was getting ready to begin writing Stable Relation, a writer/friend suggested that I get in shape by writing 1500 words a day for a month. It felt like a ridiculously impossible feat but I have step-kids so I started there. Then I wrote about every dog I ever loved, and politics I aspire to, and funny things I remembered. The words I rattled off gave me understanding because writing is always therapy. My words got common and ordinary, so they did what I asked. I wrote about everything except what my book was about; this exercise is less about result and more about creating a habit. Somewhere a couple of weeks in, I found a confidence I didn’t expect and a list of other book ideas that surfaced in during my word rants. After 30 days, it would have been the hardest thing to stop the river of words. And my real book was dying to be started. I felt like a Thoroughbred in the starting gate. This week: The assignment is simple: Just write. It’s the same if you’re a dreamer or published author. Don’t worry about genre or format or “voice”; it’s all equal between you and your words. Write stream-of-consciousness words with no editing or spell check. No whining, no judging. Do you work full time like I do? Then get up early. Just start; open the floodgate and let the words run where they may. Do it every single day. Let the words be silly or stilted, empty or filled with emotion; think word count above word content. Write words so prolifically that you throw them away. Trust your words to come when they’re called and then let yourself love them without constraint. Not less than 500 words, but know that it only takes about an hour to pound out 1500 words. You set your word goal and your time schedule. Make a 7-day commitment to start, but a month is better. Remember to thank yourself every day. Then in a week, post a comment or a blog about your experience on our private Facebook page and let us know how it’s going. (If you want to join us there, “friend” me and I’ll add you.) If you prefer staying silent, we do understand. We’re all introverts here. Who else would sit alone with keyboard for hours? But stay with us. Enjoyed this post. I try and write everyday before the world around me wakes. I’m a morning person 🙂 Sometimes it’s scenes for upcoming novels, or future blog post, or just journaling. Me, too. The morning seems to be the only time of the day remotely within my control. Nodding to you, my predawn sister! This just might be the kick in the but I need to write a blog post every day! That’s a great exercise and one that you can keep going when between larger projects and one I’ve practiced for a long time. It pays to go back over those daily pieces to see if there is something worth developing further. It’s okay too if it’s poetry instead of prose, sometimes the words just come out that way. I found too that as you keep doing this your editing takes less time, the words come out as they should and it’s mostly a case of getting the spelling and punctuation fixed and occasionally a little tinkering in an awkward sentence. It’s surprising what comes out some days, especially if you don’t decide what you’re going to write about, just sit down and let it flow, enjoy the process. So true… love stream of consciousness… I always find out something I didn’t know!